A misfire on all fronts. Not funny enough to be a satire and not hard hitting enough to be taken seriously. What drove Pitt to do this? 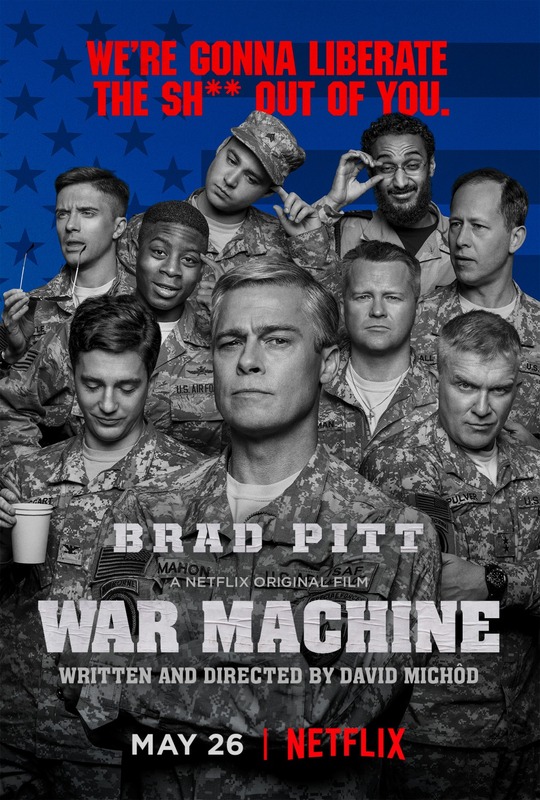 A successful, charismatic four-star general, Glenn McMahon (Brad Pitt) leaps in like a rock star to command NATO forces in Afghanistan, only to be taken down by a journalist’s no-holds-barred exposé. My reaction while watching this drab affair. To describe Glenn McMahon, I would have to say that “he was a throwback to another era”. A bit like the actor that’s playing him. I didn’t know anything about McMahon before approaching this and after watching War Machine, I certainly don’t want to. I don’t know whether that was down to Pitt’s performance. BUT it was a joke for all the wrong reasons. His gruff voice, the face pulling and that weird run? Jogging about the place like he had the sh*ts. I’m sure it was supposed to be comical BUT it was hard to show empathy towards a complete simpleton. Was that the punch line? Despite the overlong running length, it was surprisingly watchable as McMahon made his assessments. Scoot McNairy’s droning commentary delivered some insightful quips BUT it went on a bit. Free reign over his command as long as it didn’t involve bringing in more troops. Therein lies the rub. Desperate to make some sort of impact and constantly dictated to by office bureaucrats and civilian advisors; it wasn’t long before McMahon realised he’d bitten off more than he could chew. The tone was dreadfully mismatched. The Men Who Stare At Goats meets Jarhead vibe didn’t really work. For all the shocking statistics and political sniping, there wasn’t really much going on. That’s not to say that there weren’t moments to be had. I did laugh when McMahon mistook two Muslims for praying when they were actually trying to install a BluRay player. The hypocrisy was ridiculous when Glenn demanded to know why Afghan farmers were growing opiates instead of cotton and wheat. To be honest, I wasn’t surprised at the reasoning: “US cultivation funds will not support the production of a material that can be distributed in the world market and go in direct competition with the US. So we’re growing heroin instead”. “People will vote for whoever their local squad tells them to in fear of having their heads chopped off”. At one point, the man was literally left twiddling his thumbs for a month while he waited for the Afghan elections to finish. The irony even more bittersweet when the US bureaucrats were dissatisfied with the outcome and fixed another to find a more suitable candidate. A bit like now, really? I remember Topher Grace (That ‘70s Show) being a good actor. It’s a shame he keeps getting in films that don’t let him do that. Highly unmemorable. The same could be said for the majority of the supporting cast. Such a waste. Sir Ben Kingsley was disappointing as President Karzai. He did his best with the material BUT it wasn’t enough. Lakeith Stanfield (Get Out) stood out as the disillusioned Corporal Billy Cole. His frustration at the troop’s increasingly vague objectives was spot on. Alan Ruck (Ferris Bueller’s Day Off) played the shady government advisor Pat McKinnon well. The true orchestrator of this messy affair. “The longer you stay, the worse it will be for us all. Please leave now”. You could feel for McMahon’s frustration as he genuinely believed the manure he was shovelling. Receiving no “face time” with the President other than a passing handshake during a “Meet ‘n’ Greet”. The man leaked his own report just to get the ball rolling. And even then he was short changed reinforcements by 10,000 men! McMahon’s estranged relationship with his wife made for uncomfortable viewing. Equating the time they spent together to less than 30 days over the last 8 years. There was zero chemistry and killed the pace like a lead balloon. It didn’t help that McMahon came across as such a tool. His cross-examination in Berlin by a belligerent journalist (Tilda Swinton) was like wathcing a deer in headlights. There may have been valid points BUT it was just one big rant aimed at an emotionally detached military figure. I’m not sure whether that feeling of detachment was supposed to be the main theme of the piece BUT it was difficult for me to connect or care about the characters involved. The closing attack on Helmand was dull and drawn out with the end result predictable and uninteresting. Like the protagonist, War Machine felt lost in translation. I was left questioning what the filmmakers were trying to do. This would have been more hard hitting 10 years ago when we had that initial influx of Gulf war movies; Jarhead, In The Valley of Elah, The Hurt Locker. Calling Obama’s administration weak and hypocritical when the man has already left office seemed a little pointless. Watchable BUT I can’t say riveting or enlightening. Despite some eye-opening encounters, this was still a disappointing misfire that failed to deliver enough hard-hitting drama or entertaining humour.